Autumn was suspended for a few days this week; summer returned! The weather was warm and dry with virtually no wind; superb conditions for cycling. In fact, the lack of wind meant the cycling was easier than usual and we were in danger of exceeding our average touring speed of 12 mph! (We could have promoted ourselves to the Intermediates)! On Tuesday we cycled to the Old Loom Mill café on the Cuckoo Trail at Summerhill where we basked in the sunshine as we had our elevenses. It was even hotter on Thursday. Nine of us rode to Bexhill; a round trip of 44 miles which is mostly reasonably flat, apart from Chapel Hill so makes for quite a relaxed ride. The good weather certainly attracted plenty of cyclists onto the roads; it would be no exaggeration to say there were more cyclists than cars on the stretch between Pevensey and Bexhill. We couldn’t resist a photoshoot outside Bexhill’s iconic art deco building, the De La Warr Pavilion, before commencing our return journey. A final café stop at the Arlington Tea Gardens (24 degrees by now) before returning back across Chapel Hill to finish our ride at Friston Car Park. 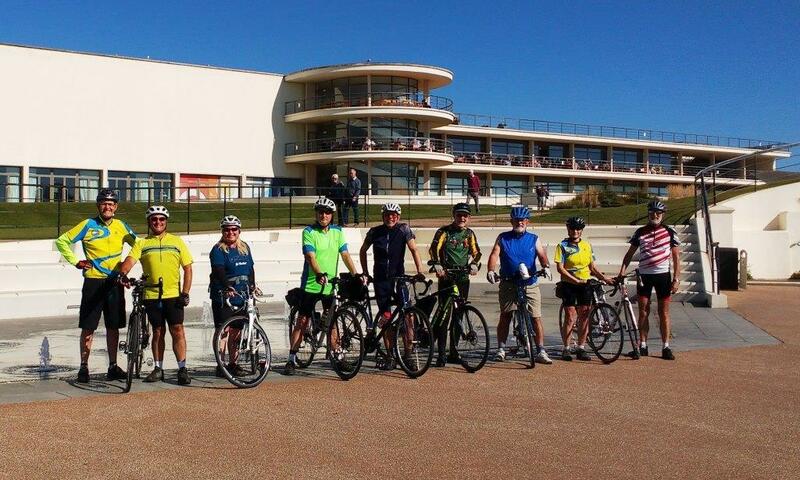 All in all this had been a terrific ride to Bexhill: great company, superb weather and a nice route. It’ll be back to autumn for our ride next Sunday which will be to Horam. Astronomers think that summer starts on the summer solstice (21st June) but meteorologists and cyclists know that it really starts on the first day of June. It’s now the 3rd June and the weather conditions for today’s Sunday morning cycle rides were perfect: warm, dry and virtually no wind. Yes. Summer has certainly arrived. The three road cycling groups, the Tourers, Intermediates and Sportives met at the Martello Tower at 8.30am. The destination was Horam so the tourers took the direct route and headed northwards to Horam. However, the sportives went west and the intermediates went east but arrived at the Lakeside Café in Horam before the tourers! Perhaps that’s not surprising as the tourers like to chat and admire the countryside. It was great to see so many other cyclists on the roads; it almost felt as if we were cycling in France although, of course, we were on the opposite side of the road. There will be more such cycle rides during the summer so it’s worth keeping an eye on the Rides Calendar. Incidentally, there are three touring rides each week, on Tuesday and Thursday as well as on Sunday. Our Tuesday touring rides now incorporate sections of shorter, flatter routes aimed at those wanting to get back into cycling. We call this ‘Easy Touring’ and the typical route distance is 11 miles. This Tuesday, we’ll be going to Ripe. Details are on the Rides Calendar. It’s a great time of year to cycle along the Cuckoo Trail. Spring has well and truly sprung; there’s an abundance of bluebells, primroses and wild garlic in the hedgerows and woodland glades, the birds are in full song and, of course, it’s traffic-free. Seven of us cycled along it today from Hailsham to Heathfield, a distance of almost eight miles. It’s a gradual climb so nothing too challenging but it probably took us about an hour to cycle as we pedalled along (at 8 mph) admiring the wild flowers and listening to the bird song. At Heathfield we had elevenses at the café in the Co-op supermarket. It’s not the sort of place where we normally have a refreshment stop but, on Joe’s recommendation, we gave it a try. Great! Good quality food and drink at competitive prices. We’ll go there again. It was a super ride back via Lions Green and Muddles Green to Exceat; all downhill apart from a couple of lumps. Was today, 6th March, the first day of Spring? It certainly felt like it as we cycled along the country lanes on our way to Ripe. The sun was shining, the air felt almost warm compared to the chilly winds of last week and there was no hint of rain. The skylarks were in full song, there were primroses flowering in the hedgerows and daffodils blooming in cottage gardens. Yes, Spring has arrived. It all made for really pleasant cycling but the icing on the cake was our stop in Ripe at one of our favourite cafés, Ripe Village Stores. So cyclist friendly, wonderful service, superb refreshments and reasonably priced; it’s the perfect café stop for us. Then it was back to Seaford via Chapel Hill; we can’t get enough of Chapel Hill. We usually cycle up it twice on our inland rides; on the Lullington side for the outward trip and on the Wilmington side for the return trip. 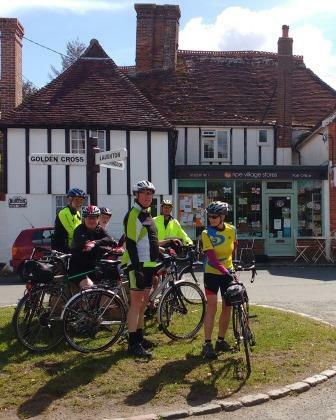 All in all, this was a very enjoyable Springtime touring ride; there will be many others over the next couple of months with some including café stops at Ripe Village Stores. And, if you don’t like hills and would prefer some flat touring, watch out for my next post later this week. Dave and me have a cunning plan! This Tuesday, six members of the Touring Section took on Sussex’s most notorious climb. After a gentle ride along the Ouse Valley Estuary Trail, we made the dash to Lewes up the C7, warming up our climbing muscles on the hill up to the Prison Crossroads. After regrouping the route took us out past Offham on the A275 and then left towards Plumpton on the B2116, and onto Underhill Lane. After a short breather to discuss tactics at the end of Underhill Lane it was straight on to the “Hill”. All riders completed the ride non-stop to the top, pausing for the obligatory photo, before descending along Ditchling Road and the back road to Stanmer Village to the Stanmer Tea Rooms for well-earned refreshments. The homeward journey was via the A27 cycle path, Kingston Village, C7, Egrets Way and Piddinghoe Village. There are usually three touring section rides each week, Tuesday, Thursday and Sunday. The tourist pace of about 12 mph average speed allows us to take in the scenery and will always involve a refreshment stop or two. Following our superb short touring ride on Tuesday five of us cycled to Littlehampton on Thursday, a round trip of 70 miles. A ride along the coast to Littlehampton is completely different to our usual rides which are along picturesque country lanes. This trip mostly involves cycling along cycle paths and promenades but still very pleasant as we see a variety of seascapes. We set off from the Martello Tower in Seaford on Thursday morning and were fortunate to be pushed along the promenade by a strong tailwind which made for easy cycling. However, the thought crossed our minds that this could become a challenging headwind for the return trip. We wondered whether we may have to cut the ride short at, say, Shoreham or Worthing. We carried on at a fair pace. It wasn’t long before we reached Saltdean where we descended down the short steep hill onto the undercliff path. Then it was ‘plain sailing’ and apart from a small hill at Brighton Marina, it was virtually flat all the way to Littlehampton. We seemed to reach Worthing quite quickly where we had a refreshment stop at the ‘Coast Café des Artistes’ on the seafront. The wind had died down somewhat so we decided to press on to Littlehampton for lunch. Littlehampton was bathed in sunshine; it usually is when we cycle there! After fish & chips at the ‘Gallery Tea Rooms’ (very good value) on the promenade we started on our return trip. There was a slight headwind but nothing too challenging. However, cycling on flat terrain against a slight headwind means that there’s no opportunity to freewheel; you’re always pedalling! It was a bit tiring so, on reaching Rottingdean, we stopped at ‘Molly’s Café’ on the promenade for afternoon tea. After about 20 minutes and suitably refreshed, we set-off to cycle the final ten miles back to Seaford. It had been a superb long touring ride. The three cafes we stopped at are on our Refreshment Stops list. We aim to have three touring rides each week: Tuesday, Thursday and Sunday. The Tuesday rides are the shortest at approximately 25 miles; the ride today was no exception. The weather conditions this morning were ideal for cycling: dry, sunny and virtually no wind. Eight of us gathered at the entrance to the car park in Friston Forest at 9.30 am and it wasn’t long before we were puffing and panting up Chapel Hill. As usual we took a breather at the top and admired the view before coasting downhill to Wilmington, passing the Long Man on the way. Our destination was Ripe but rather than go directly there we took a more circuitous route via Chalvington and Golden Cross so we could spend more time enjoying the beautiful countryside as we cycled along some superb country lanes. The café in Ripe Village Stores is one of our favourite refreshment stops and, as usual, we were warmly welcomed by the staff who are all volunteers. We lingered there for quite some time; elevenses almost became twelveses! Then it was back on our bikes and, this time, we took a direct route back to the car park at Friston Forest. It had been a thoroughly pleasant morning of cycling, superb scenery and great company. Our next ride will be to Littlehampton on Thursday, a round trip of about 70 miles. Thursday rides are our longest touring rides and are often over 50 miles. Taking a decent action photo of cyclists can involve a bit of time and effort to set up; far easier to take a photo of cyclists sitting in a café drinking tea and coffee! However, when a group of Cycle Seahaven cyclists are passing the Art Deco inspired De la Warr Pavilion at Bexhill then it’s an opportunity not to be missed. After finding the best spot to take a photo, the cyclists roll past the Pavilion and a ‘burst’ of photos is taken. The best of that ‘burst’ is shown above; I feel it was worth that extra bit of time and effort! Unfortunately, the cyclists are wearing their winter clobber so it’s not obvious that they’re members of Cycle Seahaven although you may recognise some of them. There was a chilly south westerly blowing so they donned extra clothing to keep warm. We were cycling back from Hastings where we’d had lunch on the pier. It had been a beautiful Spring morning cycling from Exceat to Hastings and hardly a breath of wind could be felt. It made for easy cycling. As so often happens when we have lunch, a wind develops which invariably turns out to be a headwind for the return leg, or so it seems. Nevertheless, it wasn’t too much of a struggle and overall it was a pleasant cycle ride, a round trip of 56 miles. The Thursday touring rides are our longest of the week so they usually involve two or three refreshment stops. Next Thursday our touring ride will be to Littlehampton, a round trip of about 70 miles. Perhaps they’ll be an opportunity for another action shot! 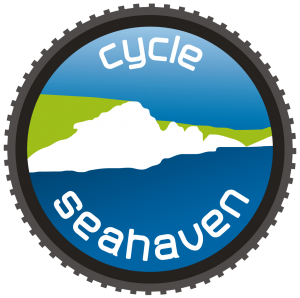 https://cycleseahaven.org.uk/wp-content/uploads/2017/04/2017-04-20-Bexhill-A-Copy.jpg 437 1024 Clive Aberdour http://cycleseahaven.org.uk/wp-content/uploads/2012/04/CycleSeahaven2-300x298.png Clive Aberdour2017-04-21 13:03:402018-03-14 13:02:16The Photogenic Tourers??? Some of those rides are shown as ‘Touring’ which are aimed at experienced road cyclists who prefer to cycle at a touring pace, ie an average of about 12½ mph; a comfortable pace where one can chat without being out of breath. Numbers on these rides are usually modest but have been creeping up recently; the ride on Sunday to Chilley Farm Café attracted ten such cyclists, the highest number for many months. As we congregated at the Martello Tower at 8.30 am on Sunday morning it was heartening to see a similar number of Sportive and Intermediate road cyclists (the faster riders); they were bound for the Lavendar Line at Isfield. The weather on Sunday was superb and, judging from the number of cyclists on the roads, it was certainly tempting people to get out on their bikes. In fact, as we cycled alongside the dykes on the Pevensey Levels, it felt as if we were cycling in Holland! It therefore came as no surprise to find the Chilley Farm Café busy with cyclists and walkers but, although we had to wait a little bit longer than usual for our ‘elevenses’, it didn’t matter. We were content to bask in the wall-to-wall sunshine and chat about sprockets, chain sets and all things cycling! It was a great Sunday morning ride, a round trip of approximately 40 miles. Hopefully, we’ll have lots more of them this year!